NASA's Dawn spacecraft obtained this image of the giant asteroid Vesta with its framing camera on July 24, 2011. Scientists analyzing observations from NASA's Dawn spacecraft announced today (May 10) that the enormous asteroid Vesta is actually an ancient protoplanet, a planetary building block left over from the solar system's earliest days. Many other Vesta-like objects were incorporated into rocky worlds such as Earth, but Vesta's development along this path was halted. 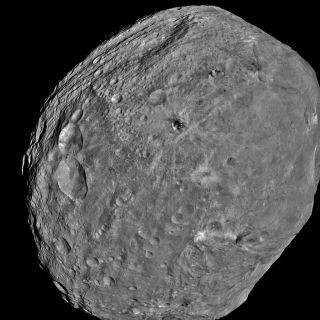 Vesta's stunted growth is chiefly a product of its location, researchers said. The protoplanets that glommed together to form Mercury, Earth, Mars and Venus did so in the inner solar system, relatively far from the disruptive gravitational influence of a giant planet. The 330-mile-wide (530-kilometer) Vesta, on the other hand, grew up in the main asteroid belt between Mars and Jupiter. And the solar system's largest planet made it tough for Vesta to hook up with others of its kind. "In the asteroid belt, Jupiter basically stirred things up so much that they weren't able to easily accrete with one another," Dawn scientist David O'Brien, of the Planetary Science Institute in Tucson, Ariz., told reporters today. "The velocities in the asteroid belt were really high, and the higher the velocity is, the harder it is for things to merge together under their own gravity," O'Brien added. "Vesta is special, because it survived the intense collisional environment of the main asteroid belt for billions of years, allowing us to interrogate a key witness to the events at the very beginning of the solar system," said Dawn deputy principal investigator Carol Raymond, of NASA's Jet Propulsion Laboratory in Pasadena, Calif.